Best Western Pembroke Inn & Conference Centre celebrates winning the most improved hotel for the second quarter in a row. 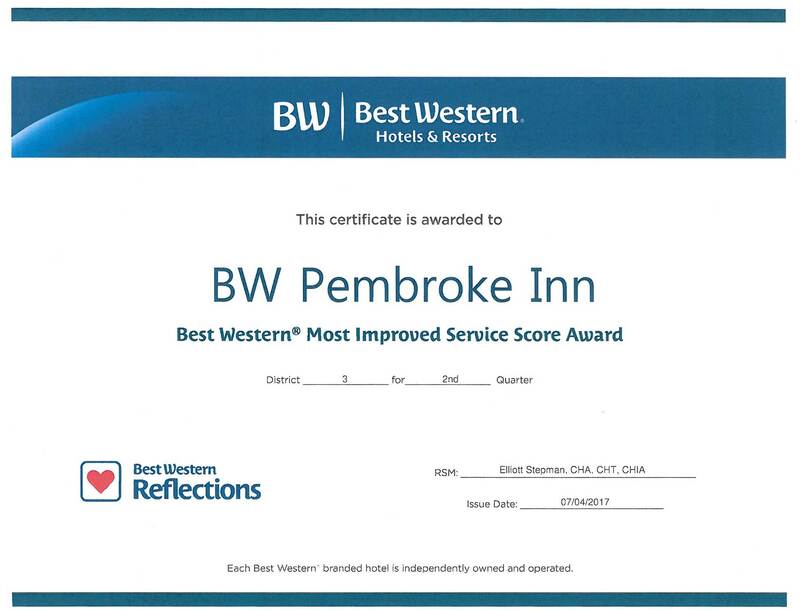 PEMBROKE ON: On this day, Best Western Pembroke Inn & Conference Centre, is proud to announce being awarded the elite “Most Improved Hotel” award. In 2012 the hotel was purchased by new owners who vowed to remodel this hotel ideally located at the intersection of the Trans Canada Highway (17) and Highway 41 in Pembroke. Since this date the hotel has been constantly evolving to eventually gain the recognition of Best Western International. With the completion of a full renovation to every nook & cranny, guests can have the piece-of-mind to know they are staying in a newly remodeled hotel nestled in the heritage city of Pembroke. The hotel’s recent success can be attributed to a dynamic relationship between the proud and energetic team, and the guests who took time to let Best Western International know of their delight in the upgrades and service. 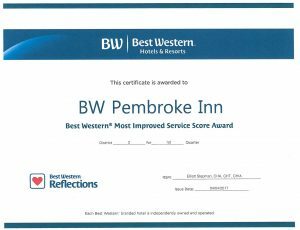 This award is one of the proudest moments the Best Western Pembroke Inn & Conference Centre staff have shared since new ownership arrived in 2012. It is also the first time in the history of the Best Western Brand that a hotel has won the most improved property award twice in a row! 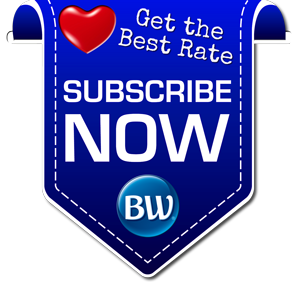 About Best Western Pembroke Inn & Conference Centre [BWP]: BWP is the largest hotel and conference centre between Ottawa to North Bay. With 88 newly remodeled hotel rooms/ suites, a fitness centre, restaurant, indoor salt water pool/ hot tub and a 9,000 square foot conference level; guests will enjoy unseen levels of comfort and service.